Thomasina was purchased from Caroline Hooper who reluctantly had to sell her due to the death of her husband Peter. The Committee decided to purchase her to complement Sgian Dubh as it was thought that a smaller double would prove more useful to the general membership. Thomasina is a double skiff which was bought by the Hoopers in 2002 with the view to using it around Whitchurch on Thames where they have a house with a garden that backs onto the Thames. Many of our members know it as they have either been there and had the generous use of their mooring, or passed by and waved! Robin Hope has had the overnight use whilst on his ‘Charity Row’ travels. Back to the skiff, Thomasina was a boat built at Hobbs of Pangbourne and used for hire, river trips and the likes. We do not actually know the year she was built. When she was purchased by the Hoopers, John Greenford was asked if he would like to ‘put her in order’ as she was in a bit of a sorry state. She spent the winter of 2002 in the Greenfords garage which had extended by 6 feet in order to accommodate her. There is a list of all the repairs made at that time. As yet we have no camping cover but that may be added in the future, but she does have a trailer, and a flat cover. Two, new to her, pairs of sculls are currently being made to fit. So the Committee hope that the Members will come forward and use her. And encourage those who have not got skiffs of their own to do so. Whilst at Beale Park, we came across boats on show from the ‘River and Racing Museum’ that has been set up there in a Barn. One such boat, a skiff’ caught our captain’s eye as being a familiar coloured varnish to that of our ’Thomasina’. 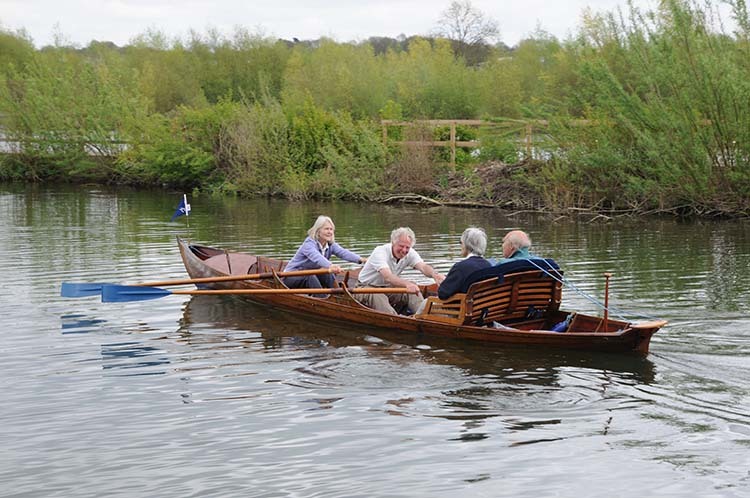 It turned out that this double was built by Ashleys of Pangbourne, as is our skiff, and was one of many bought by Hobbs when the business was sold. Jonathan Hobbs kept this skiff which is now in the Museum. Ours was bought by the owner prior to the Hoopers. The important piece of information gleaned was that this boat was built by one Wally Downing, who signed it under the thwart, in 1908. Colin and Lucy Henwood’s ‘Gillian’ was also from this stable and the same date. We therefore asked Colin to come and give ‘Thomasina’ the once over! Her fine ribs are very similar to those of both the other boats and she has other features in common. Colin was of the opinion that she too could have been built about the same time and by the same builder. Now we have to get the torch out and contort our necks in order to see if we can find a signature. There could be a faint one on one of the stretchers which is where Colin found his!